Pallet flow rack – much like carton flow racking – is a storage system where pallets are fed from one side, and retrieved from the other. This system uses a combination of rails and wheels. 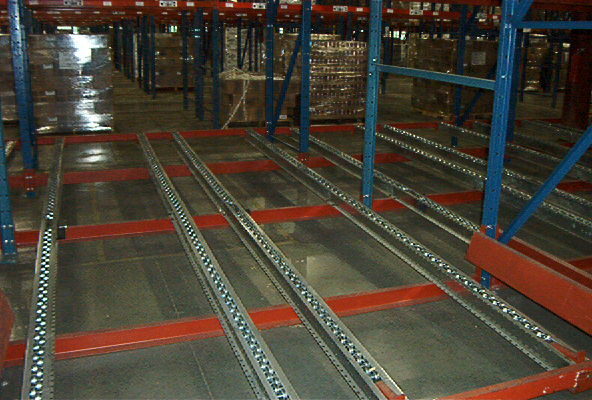 The rails are built on a slight incline, higher on the side that is fed, so that the pallets move forward when they are loaded into the system. A first in first out system, pallet flow can provide good stock rotation while providing excellent density. This is particularly true where loads are completely non-stack able. These systems have been known to enhance productivity by allowing unfettered access to pick faces with replenishment taking place from the rear.